Kubernetes is one of the most popular container platforms, which means enterprises need fast and decisive responses when security incidents and potential attacks occur within their deployments. Container security specialist NeuVector is launching an enhanced security solution to protect Kubernetes environments by building on the unique NeuVector run-time security automation, which combines east-west traffic visibility with container process monitoring and vulnerability scanning. NeuVector 2.0 adds important new capabilities that include a Kubernetes incident response system alongside advanced process and file system protections to secure against new attack vectors. It adds new automated protections that detect exploits within containers, such as suspicious processes or file system activities. The security solution automatically calculates a baseline of container processes, whitelists legitimate activity, and alerts on any deviation from the baseline. Any installation of malicious packages, libraries, or new executables -- or any modification to sensitive files -- triggers NeuVector to scan the container for vulnerabilities and alert on the suspicious activity. These automatic protections need no configuration but do allow for easy customization of rules as desired. "The highly dynamic nature of Kubernetes environments makes robust and responsive threat automation a critical requirement to enterprise security," says Fei Huang, CEO of NeuVector. 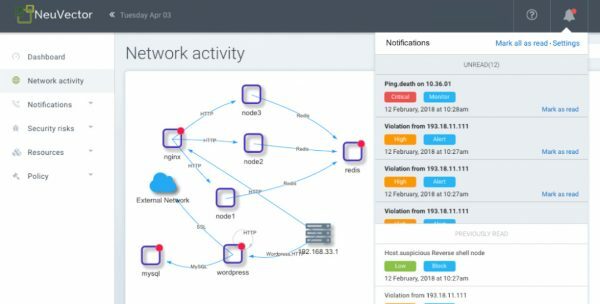 "The release of NeuVector 2.0 offers rapid detection and response that addresses security threats as they occur, while protecting systems from process and file system-based attacks. We focus on continually automating the real-time security of Kubernetes deployments for enterprises using our solution." You can find out more on the NeuVector website and the solution will be on display at the RSA Conference next week.